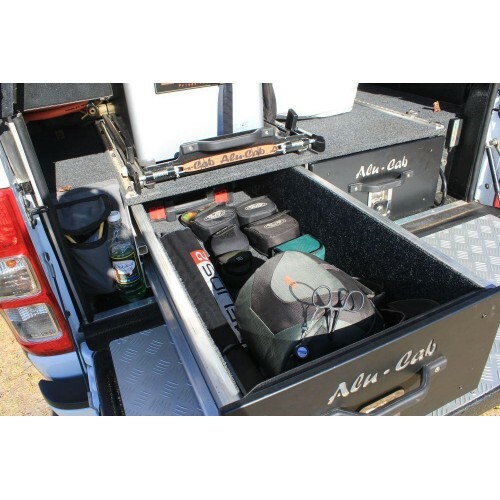 Storing work and camping equipment is made easy with Alu-Cab’s range of off-road drawers. Strength, durability and style are just a few words that are synonymous with Alu-Cab products. These attributes have been carried through to their range of double storage drawers. By constructing the drawers primarily out of aluminium they have that signature Alu-Cab characteristic of being light, strong and durable. Smooth and steady drawer action is achieved via 8 individual sealed bearings, accompanied by lockable self-latching catches. The use of spring bolts in the sliders makes removal of the drawers for cleaning easy and effortless. Robust yet soft nylon carpet lines each drawer ensuring your valuables are safely protected from scratching or rolling.